I am currently working on my syllabi for fall and am revisiting much of the social studies curriculum. In doing so I'm pulling lots of books, so this seemed like a good time to trot out another thematic list. In preparing for Virginia history I have run across a fair number of books that encompass all 50 states. There are many great resources for seeing how the 50 compare, so I thought I'd share some of my favorites. 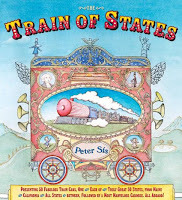 Train of States by Peter Sís - This train of states begins with an engine (driven by Uncle Sam and a bald eagle) that connects a train of cars in the order of statehood. That means Delaware is first and Hawaii is last. But wait! There is caboose representing Washington, D.C. Each page is devoted to a single train car and depicts important information about the state, as well as some interesting facts. For example, the train car for Pennsylvania (number 2) has a Crayola crayon on each end. In addition to the visually stunning and informational train cars, readers will find the state capital, tree, flower and bird depicted along the bottom with another interesting fact. (Did you know that paleontologists in New Jersey fought "bone wars" in the 1800's when the first nearly complete dinosaur skeleton was found there?) The final pages show the train pulling into a stars and stripes covered circus tent. On the very last page readers will find a series of questions and facts designed to get them thinking about creating their own train of states. Celebrate the 50 States! by Loreen Leedy - Each page in this book is visual delight, containing information on two states per page (that's four per double-page spread). A key at the beginning of the book helps explain the labels. States are arranged alphabetically, and for each on readers will find state rank, the year it entered the Union, capital, state bird and flower, and much more. Landmarks are pictured, as well as symbols of the state. Each page has a question for readers to research. Don't worry, answers are included! United Tweets of America by Hudson Talbot - Ostensibly about state birds and a bird pageant, this book presents information about each state as the birds take center stage. 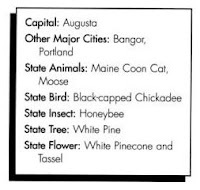 Here you will also find the state capital, nickname, flower, and more. For example, the page for Maryland shows an image of the state with the capital pinpointed and named. The illustration shows a Baltimore Oriole (on a pitcher's mound) throwing a crab cake. Famous Baltimore Orioles are listed. Information is also presented about The Star Spangled Banner. Overall this is a very fun read with great tidbits of information. If you want additional information you can read my review of the book. Go, Go America by Dan Yaccarino - Take a trip with the Farley family as they travel across America from Maine to Hawaii, learning all kinds of outrageous and interesting facts along the way. This one is packed with lots of fun facts that kids will love, as well as the standard list of state facts in the back matter. If you want additional information you can read my review of the book. National Geographic Our Fifty States by Mark Bockenhauer - This beautifully illustrated and gorgeously photographed volume contains information on the states organized by regions. Each state gets four pages of information, including important historic events, a map and photos. At the end of the book readers will find information about each of the U.S. territories, as well as facts and figures about the United States. The United States Cookbook - Fabulous Foods and Fascinating Facts From All 50 States by Joan D'Amico and Karen Eich Drummond - What could be more fun than cooking your way through the states? After an introduction to the kitchen (can't you just imagine the connections to math here? ), this book is divided into regions. Each state within a region is presented with a map highlighting the capital and major cities, as well as a box of information. An example is below. After this readers get a brief narrative introduction to the state. Next up is information on the foods of that state, followed by a mouth-watering recipe (for Maine it's blueberry cornbread) and fun food facts. My favorite recipe has to be Utah's Mallo-Mallo Fudge Squares! This is a fun book chock full of information that kids will want to dive into. The Little Man in the Map: With Clues to Remember all 50 States by E. Andrew Martonyi - While this book is not a factual exploration of the 50 states, it is an amazing tool for helping students to identify the states on a map. Divided into regions, readers explore the map (with the help of a little man) and are introduced to visual clues as a way to remember them. The journey begins with five states in the middle of the US that look like a man with a boot on his head and then moves on through other 45 states. Told in story format, this is sure to be popular with young readers. 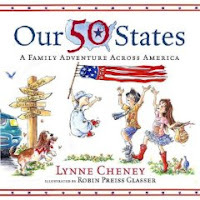 Our 50 States: A Family Adventure Across America by Lynne Cheney - Annie and Ben take a trip with their family across America, visiting each of the states. Beginning in Massachusetts and ending in Hawaii, Annie and Ben experience the sights, sounds, tastes and history of each state while sending text and e-mail messages to their grandmother describing it all. The watercolor and ink drawings use every bit of the page and are packed with information. Readers will even find decorative borders that include memorable quotations, song lyrics and historic facts. The Scrambled States of America by Laurie Keller - Uncle Sam tells the story of the time the states decided to change places with one another. At a party initiated by Kansas ("All day long we just sit here in the middle of the country. We never GO anywhere.") and Nebraska, the states meet, make friends, and hatch a plan to move to new locations. It took a while for the states to settle in, but they were so happy in their new places, near new friends. But then, Kansas, "who had switched places with Hawaii because he was sick of being stuck in the middle of the country, was not stuck in the middle of NOWHERE, feeling lonesome and seasick." Every state gets homesick for its native land, and soon they all make their way back home. The book ends with two large spreads featuring each state (smiling, of course! ), its nickname, capital, area and population. This book offers a mixed-up, engaging approach to learning a bit about the 50 states. There are a few other books that I would like to recommend, though they don't deal explicitly with each of the 50 states, they touch on many of the landmarks and places in this country that readers learn about in many of the books referenced above. My America: A Poetry Atlas of the United States by Lee Bennett Hopkins - Grouped by geographic region, this anthology contains 50 poems about this amazing place we live in. Poets represented include Carl Sandburg, Rebecca Kai Dotlich, Lee Bennett Hopkins, Nikki Giovanni, Myra Cohn Livingston, Douglas Florian and more. The United States ABCs: A Book About the People and Places of the United States by Holly Schroeder - This book presents and alphabetical look at the geography, animals, plants, people, history, and culture of the United States. A to Z United States of America by Jeff Reynolds - This is an amazing trip through the United States from Animals to Zydeco. In between readers will learn a bit about the government, history, land, map, people, and cities of the U.S., along with loads more information. Discover America State by State - This series by Sleeping Bear Press introduces each state and the District of Columbia in an alphabetic tour containing both informational (expository) and poetic text. For each book a lengthy teacher's guide is available. Finally, Reading Rainbow produced an episode where My America was the feature book. You can visit the GPN Educational Media site to view a video clip, hear audio book reviews and download teacher and parent guides. Other books highlighted were Celebrate the Fifty States, The Scrambled States of America, and Tulip Sees America. These are the texts I use when I begin a study of the 50 states. Have I missed a title you love? Let me know about it and I'll add it to the list. **Updated** - For even more books on this topic, check out the extensive 50 States Book List at Mrs. McGowan's First Grade. Here you'll find a list of titles organized by the states they discuss or are set in. Thanks to Mrs. McGowan for the link! I have a few great books to add to your collection that I use when teaching the electoral process to second graders. I read House Mouse, Senate Mouse by Peter W. Barnes and Woodrow for President: A Tail of Voting, Campaigns, and Elections . I always read Duck for President and My Teacher for President :-) I have my students write (as for a center) a letter to the author about if they agree with the author about their teacher running for president and I have them give supporting reasons in their answer. With your permission, I will add your blog post link to the page when it's updated this summer. I reviewed Greetings from the 50 States -- due out in September, and another must have for states is Go Go America!! You might also want to include Diane Siebert's poetry book TOUR AMERICA: A JOURNEY THROUGH POEMS AND ART. Siebert doesn't include a poem for each of the fifty states--but she has poems about the Badlands, Mount Rushmore, Great Salt Lake, Old Faithful, etc. Train of States and My America are some favorites of mine! Can't recall other titles I love since my classroom is all packed up right now. However, my kids LOVE my poster of the Preamble in License Plates from the 50 States and the Gettysburg Address in cereal box letters. Nice art tie-in. These thematic lists are fantastic. I'm always wishing for things like this! Thank you. My Book Around the States folks are reading books about every state plus DC. My suggestion is Erin Gruwell's The Freedom Writers Diary, which you may have read already. Come read with us (Book Buddies) or share your opinion (Banned Books).